Good ol’ hats. An invention as old as time. Whether functional or fashionable, they sure can be fun to wear. And lots of people wear them! That’s why we’re doing our storytime on the great head-topper. Activity: The amazing, wonderful Little Heights Program let us borrow their hat collection to show the children. We had hats from all kinds of professions: firefighter, pilot, mail carrier, police officer, NASA engineer, construction worker and more. We even had a hat for a jester, a wizard and fancy hats for dress up. 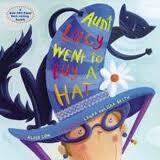 During each book and song, I pulled out a different hat and wore it. 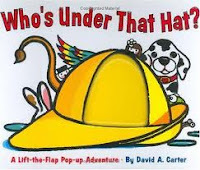 At the end, I held out each hat and let the children identify who would wear that hat (this is a wonderful activity to after you read Which Hat is That?). Art Project: Children mad their very own silly hats to take home with them. A square block was cut out of butcher paper and place over a bowl in the center (or their head or anything else with a small, round shape). After forming the paper around the bowl, a piece of masking tape was wrapped around the bowl to form the top of the hat. Then the excess paper around the edges of the center were folded in an upwards motion to create the brim of the hat.